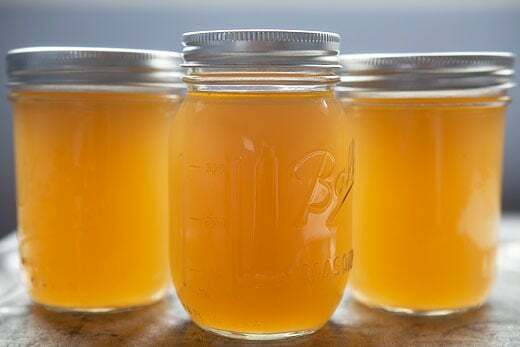 Rich in vitamins & minerals, homemade bone broths are nutritionally supreme. They are easy to make, inexpensive & incredibly flavorful too. The broth can be frozen or held in the refrigerator for a week in a sealed container, so I keep some in the fridge for cooking rice, soups & stews, sauces & to warm for drinking. The cider vinegar helps to release more minerals from the bones. 1 Roast Chicken Carcass – this includes the bones, leftover skin & any other bits remaining after serving. If you roasted your own chicken, you can include pan drippings as well. If you have 2 carcasses available, you can make a larger batch using the Stove Top method. After 10-12 hours, the carcass should easily break apart with a wooden spoon. Break it up a bit and give everything a stir, more water can be added if you’ve lost some. Cook on low for at least 10-12 hours. The carcass should easily break apart with a wooden spoon after 4 hours. Break it up a bit and give everything a stir. Add more water if the carass & ingredients are not fully covered. This entry was posted in Recipes, Soups, Tips & Tricks. Bookmark the permalink.